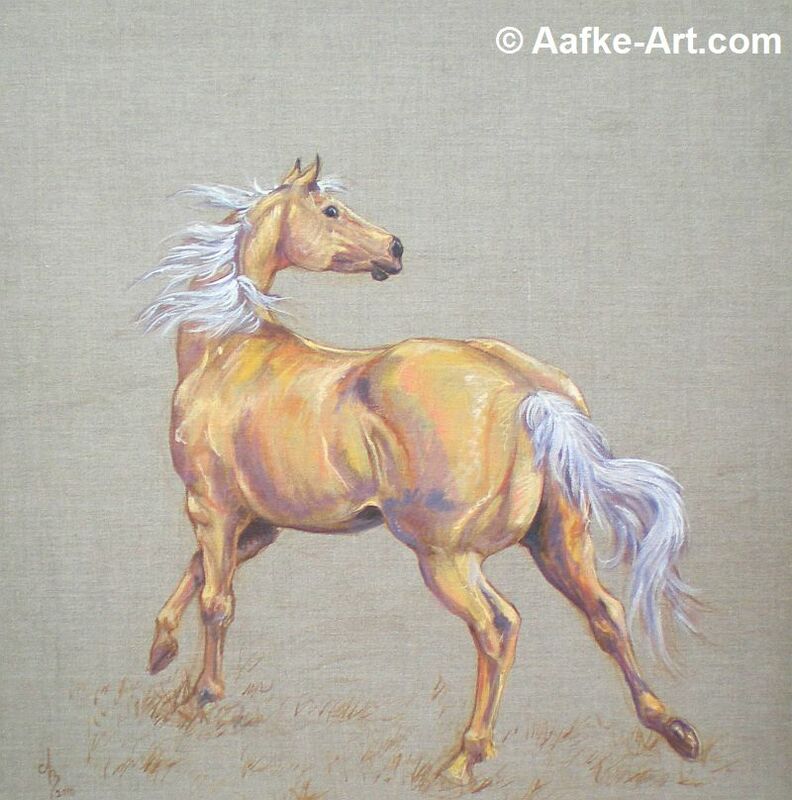 The portrait of Kit, a palomino Quarter horse mare, was commissioned by Rob and Dorien. They are very happy with the painting. I thought it would be quite interesting to know more about the lovely people who commission paintings from me, so I have started to interview everybody after I have delivered the commission. This is the first interview! 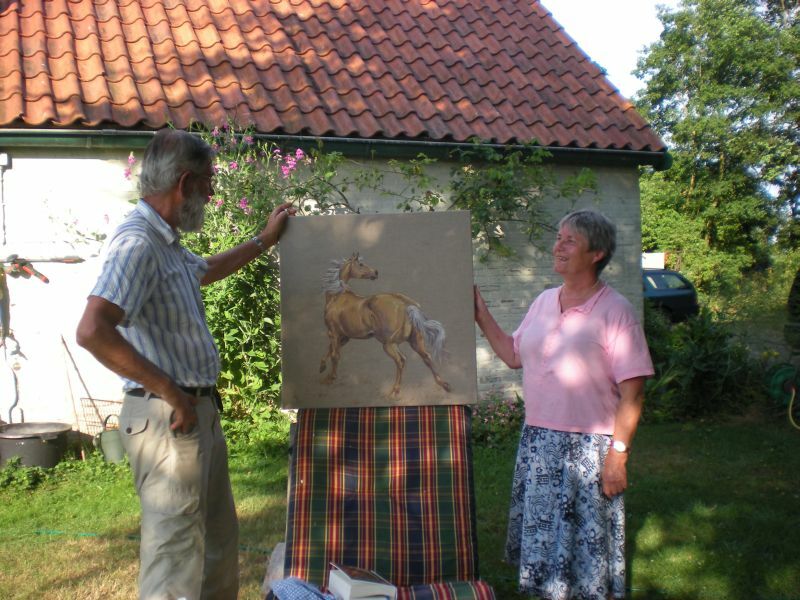 Dear Rob and Dorien, you have chosen to commission a portrait of your horse, can you tell us more about her? Our horse is an American Quarter horse mare. She is 24 years old. Her given name is Bar Cat Classic, in daily life: ”Kit”. We have owned her for 18 years, we brought her, imported from America, when she was 6 years old. She is a very sweet, but also very self willed horse. We have only used her for recreation, we never entered her in competition. Although she has a very heavy muscular build, I cannot discover any halter class horses in her ancestry, but a very diverse group with quite a lot of reining blood. So we think she is probably and old fashioned all-round horse which would be nice and stable while roping a cow. I did fall a lot for her lovely palomino colour when we brought her. When and why did the idea enter your minds to commission a portrait of your horse? When Rob was about to turn 70 in 2009, one of his sister advanced the idea to offer a nice picture of a horse as a birthday present. When we heard that we immediately thought of a painting of Rob’s own horse. So much more fun and more personal as just a picture of any old horse. Why did you choose Aafke-Art? 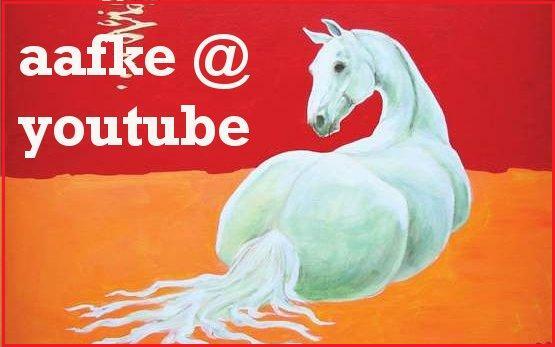 We have known Aafke since many years as a member of our national horse association and have always been impressed with her skills in drawing and painting. Especially horses are her passion, as is clear when one sees her art works. Of course this common love for horses creates an immediate connection. When the idea of a portrait of Kit entered our heads Aafke was the first painter of choice. Now the portrait is finished and in your possession, how do you feel about it? We love it! Especially those enormous buttocks! We also really like how Aafke has captured Kit’s charisma! It is if she has been rejuvenated, Aafke has watched her carefully and has captured her movements from some years ago. We asked the old lady to do a couple of show rounds through the meadow, and Aafke saw enough to be able to paint her withe her original panache. Usually the old lady doesn’t show such powerful movements anymore in the meadow since she has developed arthrosis in her front legs. She is now enjoying retirement. Are you satisfied with the Artist? The way she works and the time it took her to finish the painting? We are very pleased with the style of the paining, no background, just the natural, structured brown linen – very special and very beautiful. Nothing detracts from the horse. As far as the waiting went: When the commission was given Kit was in her winter fur and in summer her color is so much more beautiful! So we did decide to wait, but we were not in a hurry. By the motto: All good things come slowly. But we never felt we had to wait too long. Aafke is Aafke is Aafke. But then it starts to become a personal story and that is a very different story! If I am onoy to talk about Aafke the Artist, then I say: very pleased, I admire her work. Time and time again I am amazed how fast she can work and only needs a few lines to really catch her subject. I have witnessed the birth of the ”NVVR Kwartet” (a card game and the used as a gift for all our members). It was at one of our club-weekends and we have split our sides laughing about it! I saw flowing from her pen one madly funny drawing following the other with enormous speed and dexterity. The game has become iconic. For me personally my favorite card is :”The foresters daughter”, from the four cards ”Nature’s beauties” was one of the very best inventions. I am thinking that you might wish to be my website producer…that is a back ground picture for my website…another way to broadcast your talent, of which, i totally adore. Esp after seeing your perfume art. Simple elegance! Something everyone desires. As an author, my writing has to be simple and as an elegant mother, woman, wife etc., you and I agree on many terms. Let’s talk or you can interview me….it will help both of us. What do you think Aafke. Also having lived in Eindhoven, we have one common thread! Great painting and nice interview with this pleasant couple! Hi Carina, welcome to my blog! Do you mean a banner? i do design banners for other bloggers! Fee would be from $50,-, depending on how much work it would be. Susanne, they are a lovely couple! That’s a great painting Aafke! She looks alive here, with all her muscular body and energy. Yes, they do come across as a nice couple in this interview. Achelois, thanks for coming to my blog! Daisy, Yes, she is a very impressive horse! They are a lovely couple! Hi Aafke, I enjoyed reading this and of course the painting! Where are you these days? Hi Wildstorm, sorry for th delay. I love how you didn’t paint any of the background and just totally focused on Kit. What a beautiful horse! I have done a couple of these paintings, all on natural linen. I love it. It’s difficult, no room for mistakes, but very interesting as well. And I like this format for a portrait, no distractions.